This fundraising event has the potential of bringing in a lot of money if done properly. Have your sports fundraiser group speak with a local golf course about hosting a tournament. Negotiate a reduced price for 18 or 36 holes of golf and a luncheon or buffet dinner. Also, ask if they will donate prizes or sell them to you at a reduced price. Or try to get other sponsors to donate prizes, money or both. Prizes can include hats, golf balls, golf bags, shirts, a special putter, or even passes to the golf course. Charge each player an admission fee. Depending on the course you choose, this could easily be $50 – $100 or more per player. The money you raise will be dependent upon how many players you can sign up and how many sponsors you can get. If you can get a large company to sponsor your golf tournament, they may provide a lot of the players also. Ask the business to help promote your cause and post sign-up sheets for players within the organization. Another way to make money is to sell hole and tee sponsorships. Each sponsor pays for a nice sign to be placed at each hole and at each tee box, with the sponsors name on the sign. 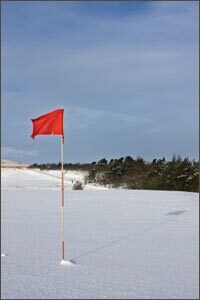 Play anyway – if lightning is not a concern and the rain or snow isn’t heavy, most golfers aren’t deterred. Cancel the tournament but still have the luncheon. Make sure that when you sell tickets to this event that the golfers know in advance what happens if the tournament is cancelled for bad weather. Let them know that they won’t get refunds, but will still get to eat. If they understand that all ticket sales go to your sports or soccer fund raiser, it shouldn’t be a problem. Another cool way to raise money with golf is to have a shoot-out. This consists of setting up a 125 yard hole at a local driving range. The hole has a 3-5 foot circle around it. Over the course of several days, charge interested golfers a dollar or two per shot. Contestants move on to the semi-final round by making a hole in one or landing a ball within the circle. The qualifiers then have a shoot-out to see who goes to the finals. Consolation prizes are given to the qualifiers and the finalists go on to round three. The finalists shoot for the closest to the pin or a chance to win a million dollars for a hole in one. A company called Hole in One International provides insurance to cover prize money for golf competitions in case someone gets a hole in one. This allows fundraising groups to generate a lot of excitement with a million dollar prize, without the risk of having to pay it out. Fundraising.com – offers sports-themed popcorn, plus t-shirts, scratchcards and even candy bars that can be adorned with custom images of your team.